Frank had a diseased oak tree in his back garden. He hired a local odd job man to cut it down. When it fell the wrong way, it smashed through his neighbour’s greenhouse roof, damaging the garden wall. The tree-feller ran off and Frank paid him nothing. Frank has not seen or heard from him since. Frank’s neighbour sued Frank for the cost of replacing the glass in the greenhouse roof, and for a number of plants that were destroyed. Frank fixed the garden wall himself. On receiving the claim, Frank sent the court an acknowledgement of service, which allowed him an extra 28 days in which to lodge his defence. Despite Frank’s best efforts he was unable to contact the tree-feller. There were rumours in the local village that the tree-feller was in prison, but no one could confirm it. Frank defended the claim on the basis that it was the tree-feller’s fault and that although he was sympathetic with his neighbour’s predicament he was not responsible for what had happened. When the case was heard at the local county court, Frank argued that he had fixed the fence but was not responsible for anything beyond his own boundary. The judge asked him numerous questions about the arrangement with the tree-feller and wanted to know whether Frank had checked whether the man had any qualifications, whether he had any insurance, and whether he provided any references. Frank admitted that he hadn’t done this, but had asked the tree feller whether he’d seen oak trees in similar conditions to his. The tree feller said that he had. Frank took this to mean that he had the requisite experience and didn’t ask any other questions. The neighbour then asked Frank whether he had any household or buildings insurance. Frank said that he didn’t. The judge said that as a homeowner Frank had a responsibility to ensure that any workmen who he hired to work on his property should be competent. In this case, Frank had not carried out any checks on the tree feller. 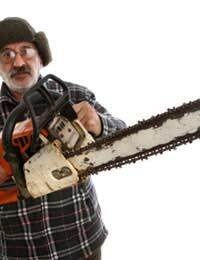 The judge suspected that he had contracted with the tree-feller because he had offered to do the work very cheaply. The judge said that Frank owed his neighbour a duty of care in this respect and found that he was liable for the damage to the neighbour’s property. The judge ordered Frank to pay for the replacement glass in the greenhouse and the cost of replacing the plants, a total of £830. Frank did not have the money to pay the neighbour and ignored the 30 day period within which to settle the debt after judgment. Frank then offered to pay the debt at a rate of £50 per month. The neighbour refused to accept this, and said that Frank had an expensive BMW so he would certainly be able to afford to pay more each month. However Frank said that he was only leasing the car and was very strapped for cash. The debt was referred back to the county court so that a court officer could decide how much Frank should pay each month.